Decision trees are incredibly versatile and powerful tools for call centers, support teams, eCommerce sites, and so much more. With a vast range of use cases and dynamic features, a well-built decision tree can streamline everyday processes, improve communications, and reduce support tickets, just to name a few! Because these tools can be used in so many different ways, it can often be difficult to think of a specific use case that makes sense for your needs – that’s where our decision tree examples come into play. 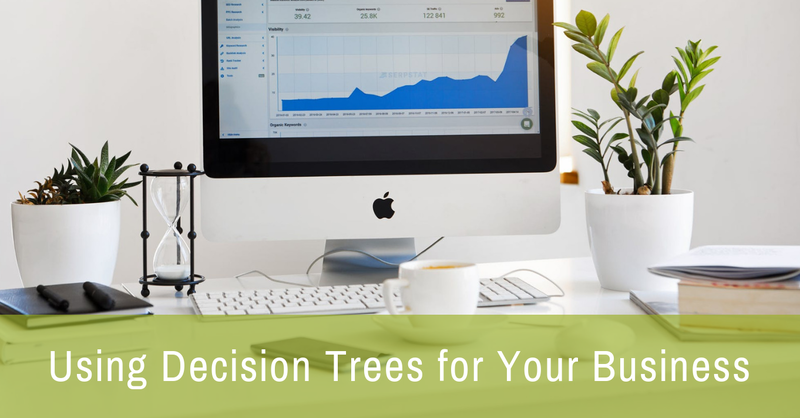 With a complete menu of decision trees that have been adapted, customized, and put to the test in real-world scenarios, it’s the best place to take a look at how they can function for any type of business. 1. How to help customers help themselves with interactive troubleshooters. In this decision tree example, you will get the most basic sense of how a decision tree can be used to facilitate better customer support. With a guided format that breaks questions down into easy pieces, customers will be much more comfortable searching for answers. 2. How to integrate decision tree tech and data into your favorite CRM tool. In this decision tree example, you’ll see how a decision tree can be set up to help showcase certain features or functionalities. With our functional Zendesk Chat demo, you can view exactly how the integration between decision trees and CRMs works. 3. How to gather all the right information with a guided customer conversation. In this decision tree example, you will be able to take a close look at how decision trees are used to build fully customized call scripts for sales, customer support, and a variety of other needs, in order to help improve the customer experience. 4. How to easily schedule appointments with all of the correct specifications. In this decision tree example, you can view exactly how decision trees are used to help make the process of scheduling appointments less of a hassle. You’re able to gather important info and route that customer where they need to go, all through an interactive platform embedded right on your site. 5. How to collect and verify important, personal customer data during a call. In this decision tree example, you’ll see how a basic call script works within a guided decision tree format. With Zingtree, you can easily collect and verify customer data like phone number, email, and USPS address to cut down on resources. 6. How to generate a full PDF document and send it as an email in just a couple of clicks. In this decision tree example, you can get a functional look at how decision tree technology allows you to generate a custom PDF document based on the information gathered, then sending it off via email in one fell swoop. 7. How to help your customers find the perfect pair of sunglasses (or any other product for sale). In this decision tree example, you can see how a product finder decision tree enables online retail, eCommerce, and other businesses operating online to help customers find exactly what they need in an interactive environment. See decision tree examples for customer support. See decision tree examples for call centers. See decision tree examples for business processes. See decision tree examples for retail and eCommerce. See decision tree examples for sales. See decision tree examples for medical. See decision tree examples for insurance. See decision tree examples for training. See decision tree examples with logic. See decision tree examples for generating documents. See decision tree examples for Zendesk. See decision tree examples for live chat. To see all of our decision tree examples in action, visit our complete gallery of trees right here. Any questions? Please reach out!